First line: 'Wild by name and wild by nature,' Dortchen's father used to say of her. Review: I begged for a review copy of this novel knowing nothing about but that it was Kate Forsyth's newest. Forsyth wrote one of my 2013 top ten reads, Bitter Greens, and I will basically read anything she writes. My blind devotion was well rewarded with this one! Set in the early 19th century, this novel follows Dortchen Wild, neighbor of the Grimm brothers -- yes, those Grimm brothers. 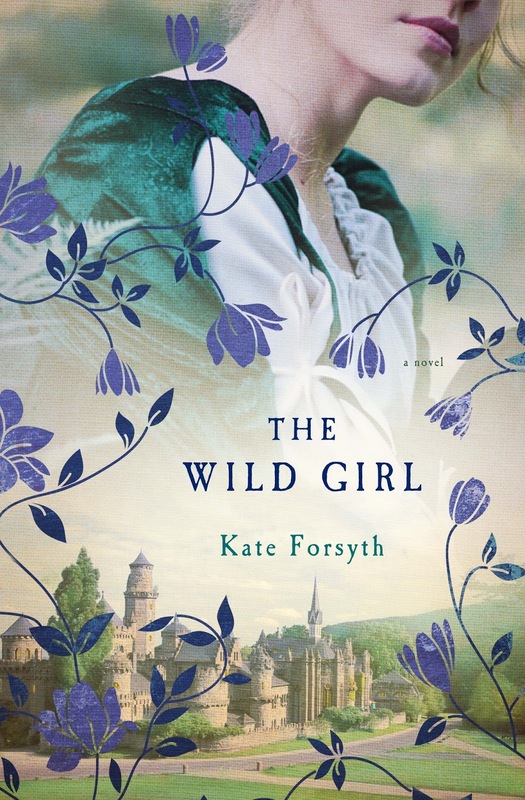 One of a handful of daughters of a cruel apothecary, Dortchen has had feelings for Wilhelm Grimm, but a relationship between them seems impossible: Wilhelm is poor and seems more interested in her older sister, and her father is ruthlessly controlling of her and her time. Still, Dortchen maintains contact with the Grimm family, eventually becoming a crucial source for Wilhelm and Jakob as they assemble their volumes of German folk tales. Although I expected this novel to be more about the fairy tales -- perhaps even some retellings of Grimm's most well known stories -- this is actually a novel about how the stories were gathered, and most importantly, who told the stories to Wilhelm and Jakob. In her opening note, Forsyth points out that the Grimm brothers were collecting their tales as young men at the same time of Byron and Austen -- not musty old men from the Dark Ages, as many (like me!) might imagine. Even more, the interest in gathering these stories came out of a desire to preserve rural German culture in the face of Napoleon's relentless conquest and rule. It was this political background that made this story most fascinating and illuminating, and the narrative is flavored by the terror of occupation and the cruel realities of war. Dortchen and Wilhelm's relationship is slow to grow, made more complicated by some terrible abuse Dortchen suffers. Here is where Forsyth's skill shows, for she makes the tribulations suffered by Dortchen both grimly realistic and reminiscent of the trials of a fairy tale heroine, mythical and mundane in equal part. I didn't know whether to wallow in the unfairness of life or hope for magic beans to liberate her, but I needn't have worried as Dortchen is an immensely capable heroine. Her story left me teary and a bit breathless. Fairy tale retellings are very trendy, and I appreciate this "behind the scenes" kind of story that makes those familiar stories richer and more intriguing. Those who like a knockout heroine who doesn't wait to be rescued will love this one as Dortchen has neither a Prince Charming nor Fairy Godmother to rescue her. This is a nice brick of a novel that reads very quickly and is wildly engrossing -- the kind of historical fiction that will send you down Wiki rabbit holes and stick in your mind for quite a while. I'm thrilled to offer a copy of The Wild Girl to one lucky reader! To enter, fill out this brief form. Open to US readers only, ends 7/24. See my Giveaway Policy for complete rules. I cannot wait to read this book! I loved, loved, loved "Bitter Greens." I think I loved Bitter Greens more, but this one grows on me every day. It was moving and exciting and illuminating -- can't wait to see what you think of it! Sounds fantastic, and the cover is gorgeous! I know, the cover is stunning -- the AU and UK covers I'm less wild abt -- but this one is so eye-catching! I'm not familiar with this author but you've sure made the book sound good. Thanks for the giveaway! This is an unbelievably beautiful cover!! I'm so excited to read this! I have this on my shelf. I need to read it! This sounds so good! Kate Forsyth is one of those authors I have been meaning to read for much too long!